Kaspersky Internet Security, is it worth it? Malware protection test scores are not as high as they should be. There is not a single antivirus product in the market today that can outscore Kaspersky Internet Security when it comes to independent lab scores. But more importantly, it offers a service which is consistent and effective. Because in the end, that is really what counts. Many media sources have made allegations against Kaspersky Labs for having inappropriate business dealings with the government in Russia. However, until there is some concrete evidence which proves all these allegations, we think it is far to treat such allegations as unproven. Kaspersky Internet Security remains a strong antivirus product and unless it drops its performance in this regard, we will continue to review it on merit rather than media speculation. No one needs any convincing that in the modern world of the internet, the need for antivirus protection is actually a must for all computer machines. Given the fact that ransomware attacks have continued to grow than ever, it is now even more important to have antivirus protection. However, it is also true that the minimum organizations and users should aim for is a basic antivirus product. For better protection, the more suitable product is the full-scale antivirus security suites that have started to become fairly popular in the market. These are better than base antivirus products because they offer protection on a number of different levels. We all know that Kaspersky has a great antivirus product. The more important thing is that all of the above-mentioned components work well and perform their security tasks well. The official price for Kaspersky Internet Security is around $79.99 per 12 months. With this subscription package, users can protect three of their devices. Those who want to increase their number of devices can do so by paying $89.99 for a total of five licenses. Moreover, Kaspersky rewards first-time customers with significant discounts. That doesn’t always happen and often enough that it deserved a mention here. For comparison’s sake, McAfee Internet Security offers users an unlimited number of licenses for only $89.99. With that package, users can protect all of their devices, no matter their number. On the other hand, Webroot offers users a package which protects three devices for a price of $59.99. This is, as is obvious, slightly less expensive than Kaspersky Internet Security. The main window offers users a spacious look. Moreover, the application also features a huge banner which shows the user his/her current status right at the top of the screen. If the application detects that there is a configuration problem then it offers users a link so that they are able to set things in the right manner. There is also a panel on the main menu screen. There is also another button which is located just below the big button at the top. If the user clicks that button it opens up another menu which shows users even more tools. In the bottom left corner, there is also a gear icon which opens up the Settings menu. Our research shows that some users might find it troubling to find their desired options and settings sometimes. We say that because if one goes to the application’s Protection page, it features a total of 15 separate components. All of them are distinct from each other. Moreover, they don’t come in any order. Hence, it would be better for the users if Kaspersky Internet Security introduces a Search box for all its settings options just like users get in the iPhone version for searching Settings. 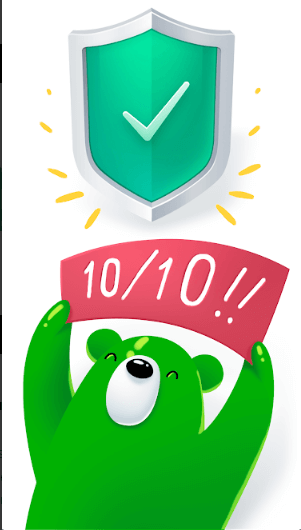 Naturally, the Kaspersky Internet Security suite includes each and every security feature that any user gets with Kaspersky free. Additionally, the official Kaspersky free antivirus application models its user interface on the new Kaspersky Internet Security instead of the company’s commercial product Kaspersky Anti-Virus. Whichever user signs up for the Kaspersky Internet Security suite automatically enables all its features. We’ll summarize some of the security features that this suite shares with Kaspersky Free. Users who want to read more on each of them should consult our other reviews. As mentioned time and time again here that we follow a total of four independent antivirus labs that test antivirus products. All of those labs include Kaspersky in their scheduled antivirus reports. That in itself is some achievement as these labs don’t just analyze any antivirus product. The latest scheduled set of performance reports from these labs indicate that Kaspersky managed to earn the maximum available marks again. Any test that these labs threw at Kaspersky’s way, it scored the maximum marks in it. The only other security product that has come close to managing the same feat is Bitdefender Internet Security. However, in the end, Bitdefender did not manage to score perfect marks in one antivirus test. As far as the history of the product goes, some of our readers might already know that Kaspersky reserved its advanced features and components such as the System Watcher for its paid products. However, that has changed now. With the 2019 edition of its free antivirus, the behavioral feature and other components have finally made their way to consumers who don’t want to pay for their antivirus protection. Our research shows that the System Watcher feature can catch any and all ransomware samples even if the user turns off the regular real-time antivirus protection. What isn’t great is the fact that Kaspersky did not perform that well in various malware protection tests. This is never a good sign for any product. Our research shows that Kaspersky can score around 85 percent marks on various malware tests. With that said, it is also true that whenever an antivirus product gives different results for local malware tests and independent lab test results, one should always go with the independent lab test results. With the same set of malware samples, antivirus products such as F-Secure and Cylance managed to score 93 percent marks. Our research also shows that if one tested the likes of Webroot Internet Security and Norton with an older malware sample set, they have the ability to score perfect marks. However, since one can’t compare antivirus products based on two different samples of malware, these numbers don’t provide anything that can help someone to compare these products. Of course, a 100 percent performance in any test is good whether it is old or new. Whenever there is a need to test an antivirus product, one has to check how the product blocks malware downloads. Our research shows that if one throws a hundred of new and recently discovered URLs ridden with malware, Kaspersky has the ability to rise up to the challenge and eliminate and/or block access to the malware-ridden URL a whopping 90 percent of the time. Needless to say, that is a pretty good detection rate. However, in similar tests, Bitdefender has managed to score 99 percent. Close behind Bitdefender are Trend Micro and Norton, both of which have managed to score 97 and 98 percent respectively. Our research shows that in the past, Kaspersky wasn’t that great at performing in various antiphishing tests. In fact, there was a time when Kaspersky had a score of 44 percent. Most testers would call that a dismal score. Even mainstream browsers such as Internet Explorer, Mozilla Firefox and Chrome all scored better than Kaspersky. However, when developers listened to feedback from various reviewers, they found problems and then they worked on those problems. After some time, Kaspersky started to perform better at detecting phishing URL. Our research shows that Kaspersky, after the fix, had the ability to detect a 100 percent of such URLs acting as phishing sites. This score meant that it successfully edged Bitdefender that had a detection rate of 99 percent. At this moment in time, Kaspersky is the best at blocking phishing URLs. If we’re talking about some more features, then readers should know that all of the currently available Kaspersky security commercial products come with a bandwidth-limited but free edition of the company’s VPN service. The company has called its VPN service as Kaspersky Secure Connection. We have already mentioned the fact that Kaspersky Secure Connection is not a standalone and exclusive VPN offering from Kaspersky. AnchorFree Hotspot Shield Elite actually powers the Kaspersky Secure Connection VPN. This VPN service, when using the free edition, offers users a total of 200MB of online bandwidth per 24 hours on any of the user’s given device. If the user is ready to pay the company an extra $4.99 per month, then the company lifts the VPN service’s bandwidth cap. After payment, it also allows users to specify their preferred country for their VPN server. Other internet security suites such as Bitdefender also offer similar deals to users. Bitdefender’s VPN service is also dependent on AnchorFree since AnchorFree powers that as well. Some of the other bonus features that users get access to include a new on-screen virtual keyboard. This is great for users who want to make sure they are able to foil keyloggers. One of the other bonus features includes a new markup system. Its job is to identify dangerous links that may appear in search results. What about Kaspersky premium antivirus? Are there any shared features there? One of the greatest advantages of actually paying for an antivirus product like Kaspersky Anti-Virus is that the user gets complete access to the company’s technical support. Users can get help either via live chat and/or phone. Online users who have only downloaded the free edition of Kaspersky antivirus products only get to rely on forums and FAQs. Apart from that difference, premium users also gain the ability to actually tweak a few of the settings which the company locks out in its free antivirus edition. In order to really test the Kaspersky System Watcher’s skills in ransomware protection, one has to make use of the product’s commercial edition. Because the free version does not allow users to turn off their ordinary and real-time malware protection component. On some occasions, it is entirely possible that the user may come across and/or encounter a persistent piece of malware. We’re talking about a threat that just refuses to go away and actually prevents the user from installing any Kaspersky product. Of course, we’re also talking about that malware which can stop Kaspersky from running a system scan. In any such cases, Kaspersky offers users a Rescue Disk option. These options can help a lot. If the user has a clean computer system, and then the user downloads a given ISO file which represents the company’s Rescue Disk feature, then the user can convert it into a physical disk by going through the burning process. Any given user who tries to boot the system via the Rescue Disk actually starts the machine with an alternate OS or operating system. Such an action actually effectively neuters any and all malware based on the Windows operating system. As far as Bitdefender is concerned, the user does not even need to actually burn a disk. All that the user has to do is to reboot the machine in Bitdefender Rescue Mode. If we’re talking about hackers that most readers would already know that hackers basically take advantage of security holes to attack systems. The job of the security companies is to patch those security holes. If the user fails to apply any important patch, then he/she can land himself in deep trouble. Kaspersky offers users a Vulnerability Scan regular reports. These reports can actually find any and all missing security patches for the user’s Windows operating system and other widely known applications. Kaspersky can also report on various configuration settings which it feels are actually bad news for the user’s online security. Along with reporting that fact it also offers users an option on how to fix configuration settings automatically. There are lots of other pretty similar scan applications in the market. But we’re not here for those. We are here for features such as Microsoft Troubleshooting scans, Privacy Cleaner, and the Browser Configuration Check. Our research shows that there is a definite overlap between these features. To start off, all of these security features look for privacy and/or security problems. Then they report those problems in a total of three different categories. Problems that the user should resolve. Problems that the user should really resolve. Moreover, once the user has managed to select any of the above-mentioned options, the user is free to run the option again in order to roll back all of its actions. Whenever the user wants to navigate to an online banking website and/or any other kind of sensitive website online, Kaspersky quickly jumps in and tries to open that specific website via its Safe Money feature. The Safe Money feature is actually a protected web browser. All the default settings indicate that once the user has accepted the offer to use the Safe Money browser, Kaspersky always tries to open that specific website in its exclusive protected web browser. This is pretty similar to how the Safepay feature works in Bitdefender’s offering. In order to remind the user that he/she is in a special and protected web browser mode, Kaspersky shows a green border all around the web browser. It also shows the user a kind of semi-transparent notice overlay. The job of the overlay is also to remind the user of the special mode. When the user has turned on the Safe Money mode, Kaspersky wants the user to know that the user is now in a web browser that is completed isolated from all of the machine’s other processes. As indicated earlier, this feature even has the ability to foil spy applications that make use of various screen-scraping techniques. Another feature that is completely new in the latest edition, is that users have the option of opening the menu that appears via the notification area icon and then select from the shown list of sites which the user has already visited with Kaspersky Safe Money. In this way, the user can quickly revisit and use any of the listed websites. Users who make use of email systems which are web-based such as Gmail and/or Yahoo, are lucky in the sense that they normally do not come across a lot of spam messages. Email service providers such as Gmail and Yahoo have complicated and effective filters that remove spam messages way before they ever reach the user’s mailbox. In a similar way, it is also true that if a given user only gets email messages via his/her workplace then he/she probably gets spared from the majority of spam messages. Perhaps that is the reason why Kaspersky turns off its spam filtering feature by default. Of course, the user is free to turn the feature on by simply performing a click on the gear icon which takes the user to the Settings and then performing another click on the left-hand side where it says Protection AND then making one’s way down to the option that says Anti-Spam. The user will have to do a bit of scrolling but with modern mouse equipment that should be a piece of cake. Now, the way Kaspersky works is that it first checks all the email messages coming from the user’s IMAP and POP3 accounts. Then it begins the process of marking messages that it thinks are spam. It also marks up possible spam messages by altering the message’s subject line a little bit. The Kaspersky email spam filter comes with three modes. As some of our readers would already understand, if the user sets the filter to High, the filter would start marking more messages as spam. In the process of doing so, it may also sometimes discard legitimate and valid email messages. If the user changes the spam filter’s setting to Low then it will start working the opposite way. By that we mean, that it will mark a few number of messages of spam. However, in the process of doing so, it may allow more spam into the user’s email box. It is also true that if the user sets the filter to Low then the user avoids the possibility of losing a valuable and/or important message to the Kaspersky spam filter. As far as basic settings go, that is pretty much it. Users who have the courage to actually open the page for Advanced Settings should know that Kaspersky offers just a few more configuration options than “Advanced Settings. However, the number of pages that contain those settings is not overwhelming. That is not the case with ZoneAlarm Extreme Security which has a large number of Settings pages that one has to deal with its spam filtering feature. Users are free to modify the message’s subject line label that Kaspersky has chosen for the message in order to flag the message as spam. Moreover, Users also have the option of configuring a long list of phrases that the spam filter blocks by default. These are phrases that the spam filter keeps an eye out for in various email messages and if it finds one of these in a given message, it marks that message has spam. The one other option we would like to talk about here is the ability of the user to actually manage the list of blocked and allowed senders. For the majority of online users, we think that the default settings would work pretty well. Perhaps this feature is pretty similar to the spam filtering feature in the sense that not a lot of online consumers would have any need for it. In any case, when the user activates the parental control feature, the parental control feature insists that the user should create a new password. It does that in order to make sure that kids have no opportunity to just turn off the parental control protection. After asking for the password, the parental control feature lists each and every Windows user account. This, in turn, gives the user the opportunity to actually turn on the official parental control feature for only those who may need the feature. Needless to say, once the user has enabled the official parental control feature, the user is free to configure it in order to suit his/her needs. 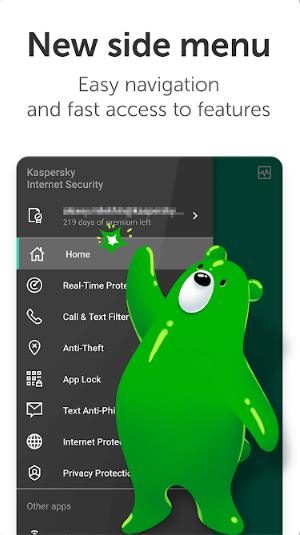 The official Kaspersky parental control feature offers users a number of different methods to apply limits on device usage. It offers options such as defining a specific time span. The parental control feature can control devices according to time spans which are different from the weekends and weekdays. In any given time span, the child does not have the option of using the device. Apart from the time span, the parent can also come up with a limit on the total amount of time a kid can use a device. And if the user prefers that, Kaspersky parental control also allows him/her to switch to the full week (seven-day) schedule of when the device is permitted to be used and when it isn’t. Regardless of what the user selects, the official Kaspersky parental control feature allows the parent to add those well sought-after enforced breaks. To take an example, if the parent has enabled enforced breaks then the parent can require the child to actually spend a total of 15 minutes out of every passing hour to stay away from the device. We admit that this break feature probably is very unusual. That’s what our research shows. Let’s move our attention to the Applications page. This is where the parent can set a specific maximum ESRB rating. To take an example, the parent is free to limit his/her child to only play PC games which the ESRB has rated no more than 13+ or Teen. Of course, people living in Europe get the option of selecting the PEGI content rating system. For all those control freaks, Kaspersky offers more options to dig into and actually block specific video games ratings and categories like Fantasy Violence and Crude Humor. Other options that are available in the Applications page, include granting the user the ability to block the use of certain programs and/or program categories and/or even set restrictions on time. A lot of the parental control systems that we have come across actually have no problems in putting web content filtering front, right, and center. It hides that feature on its Internet page. The Internet page also enables users to actually put a limit on total Internet time which is a separate value from the time limit put on device use. The same page comes with other options such as Safe Search enforcement and the blocking of downloads of various file types. If the user makes his/her way to the content filtering tab/page, he/she is free to accept the Kaspersky parental control features default suggestions for blocking content. Or, the user can make his/her own choices from a total of 14 filter categories. Our research shows that the official Kaspersky parental control system is pretty good at blocking inappropriate websites. And it can block HTTPS websites as well. It has the ability to block sites on both mainstream web browsers as well as some of the most obscure and off-brand web browsers. Perhaps the most impressive part about this parental control system is that it can correctly prevent access to even the most secure of those anonymizing online proxy websites. If a parental control system could not do that then the kid could just go to such a website and start accessing unfiltered access to various types of content on the internet. The other impressive thing is that, the system’s heuristic analysis means it has the ability to enable access to a website about short stories and all the while, block erotica stories on the same website. Parents also have the option of configuring the official Kaspersky to prevent transmission of data that is too personal. Such type of data would include the user’s phone number as well as home address. There is also a related feature which enables the detection of various specific online keywords that appear in messages and web forms. Readers should note that the keyword feature here only logs the search term, message and/or any other entry. Apart from all these parental control features that we have described so far, Kaspersky parental control system also offers a detailed activity and monitoring report of each of the registered child. Readers and users who want to know more about any topic have the option of digging in deeper for more details and/or click the option to jump right to the entry’s corresponding settings. Users who have used Kaspersky for a long time now may actually notice one tiny little change. That little change comes in the form of the parental control system in Kaspersky Internet Security suite and also the corresponding version of the suite on the Mac OS, abandoning its attempts to control and track the user’s social media friends/contacts. Users who want that feature will have to sign up for the Kaspersky Safe Kids which is pretty high end. But the important point is that it is still available for users who are ready to pay more for the privilege. Of course, users have the option of signing up for the Kaspersky Total Security which is the company’s mega-suite and the one that offers the social media contact tracking feature. 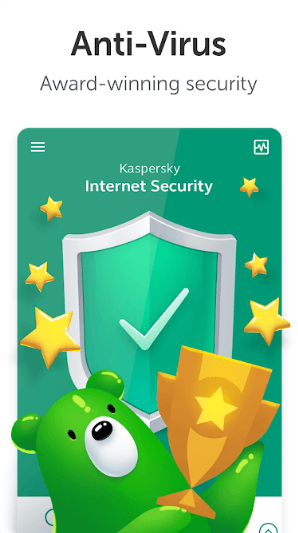 Kaspersky Safe Kids comes with other type of features which allow the user to apply a given kid’s profile across several of the available devices that the kid makes use of and that too on a multiple number of add-ons. How many of our readers have ever tried to look up a given product via online searches and then find many advertisements related to that product quietly infesting their web browsing experience? A lot, our research shows. Some think that is creepy. We’re not here to judge but those who want to get rid of this tracking can do so with the Kaspersky Private Browsing component. It can help users block advertisement agencies along with web analytics and many other trackers. However, the default settings dictate that it only watches and then reports various tracking attempts. 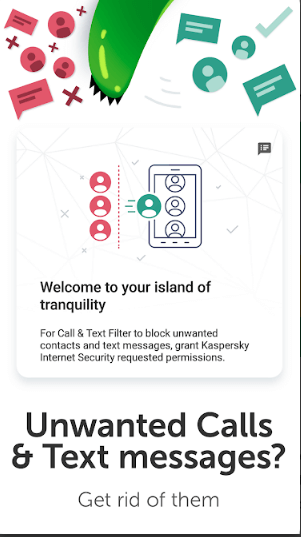 Users have the option of clicking the option that says Privacy Protection and then check that option which says something positive about blocking all data collection. Because of the default settings, Kaspersky official websites are actually exempted from such blocks. So all of the websites which belong to Kaspersky, are theoretically free to collect data by default. Moreover, Kaspersky’s partners are also allowed to do the same. Fortunately, users have the option of putting all of them right back on that chopping block to get rid of them. 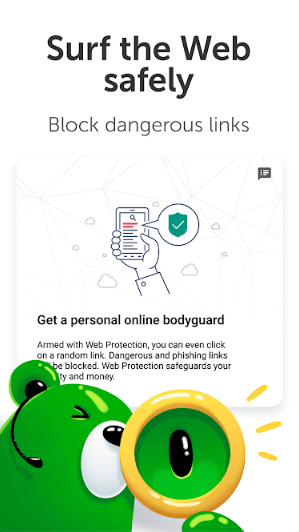 The Privacy Protection feature is intelligent enough to refrain from blocking advertisements when blocking such advertisements would actually lead to disabling the given website in some way. There is also a Kaspersky toolbar button right in the user’s web browser which displays the total number of trackers that Kaspersky has blocked on the page that the user may be currently visiting. The user can easily click the button and allow Kaspersky to perform a breakdown of all the tracking types. Users with a bit more time on their hands can dig in deeper to observe the exact list of trackers. Perhaps this is a good time to mention a related feature here as well. That feature is the Anti-Banner feature. As the name suggests, this feature tries to suppress banner advertisements from all the websites that the user visits. However, the user has to remember the fact that his/her favorite websites heavily rely on advertising revenues in order to bring him/her the content and page that the user likes. Because of that we usually advise users to deploy the Anti-Banner feature responsibly. In an attempt to have a completely distinct take on user privacy, Kaspersky offers users its spyware protection component. That component comes in the form of a tool that the company calls webcam control. If the user decides to set the spyware protection feature to deny all access, the component puts out a warning message each and every time the user has an untrusted website or process which makes an attempt to access the user’s webcam. If the webcam protection interferes with activities such as setting up a new video conference, then that’s not a problem either. The user has the option of adding the program that he/she uses for conferencing to the webcam protection’s trusted list. However, if the user sees that Kaspersky sending a warning message that does not have any relation to the kind of work that he/she is doing then the user should thank Kaspersky for taking care of some virtual creep who tried to peek through his/her webcam. Of course, there is always the option of enabling the webcam protection feature to never ask and simply block all webcam access for all types of processes. Our research shows that the webcam feature does not work as advertised. In order words, it won’t block all webcam access. Users should be ready to see that they are able to use the video chat feature even if they have told Kaspersky to block all webcam access. If one puts this problem forward to a company representative, that representative would actually confirm the problem. And would say that the company developers were working on the problem which rose up because of a recent update, Windows RS4, that Microsoft rolled out. Kaspersky AntiVirus offers users the vulnerability scan. It can notify the user whenever it detects that there is a security patch missing. However, the vulnerability scan feature doesn’t really do anything that goes beyond simply pointing out that there is a problem. That changes in the Kaspersky Internet Security suite though. Instead of a simple vulnerability scan, Kaspersky Internet Security offers users the Software Updater feature. It can not only point out the problem but also handle the entire process of updating for the user. The user does not even have to click in order to launch the software updater. Kaspersky runs it in the background automatically. Also it notifies the user if it detects and discovers newly available security updates. All that the user has to do is to review the Software Updater’s findings and then click the button that says Update All. The software updater feature will take care of the rest. The latest edition comes with some more new tricks. Using those tricks the user can control the number of times the Software Updater actually checks for any and all updates. Additionally, if the Software Updater feature detects that there is no need for the user to accept a given license agreement, then it has the ability in the latest edition to handle the whole process of updating everything automatically. The best way to guard against all exploit attacks is to keep one’s operating system along with applications updated via all the released security patches. Avira with its Total Security Suite and Avast Premier offers users features such as automatic patching as well. However, they only offer these features in only the most premium of their security product lines. As mentioned earlier, the Kaspersky Internet Security suite is only an entry-level suite that Kaspersky offers. Kaspersky Security Cloud and Kaspersky Total Security both are above it in terms of top-of-the-line security products from Kaspersky. Application control and the firewall. Who here remembers the earliest versions of what we now call personal firewalls? Those were the days when firewalls did enough to earn a reputation of bombarding their users with frequent incomprehensible queries. Such firewalls would often bother users with messages such as didier.exe wants to form a connection to a given IP address with the use of a specific port- block or allow? Needless to say, the majority of the online users lacked the required technical knowledge to actually answer such questions with any confidence. There were folks who simply clicked Allow each and every time the firewall asked a question. Then there were other folks who had made a habit of clicking the Block option unless and until they broke something. At that moment, they changed their habit to only clicking Allow. No need to fear such firewalls now. The official Kaspersky firewall can manage all application control on its own. It does not pop up any kind of confusing and frequent queries. Applications that it marks as Untrusted are never allowed to run. Those applications which did not manage it to make it to the Trusted category are allowed to run, however, application control limits their access to various sensitive areas within the system. Our research shows that it isn’t exactly uncommon to see application installers try to bundle in various additional applications and products. All are essentially items that the user did not request. Application Manager handles that as a part of the job it has to do. In other words, it automatically clears all the checkboxes which offer users to install additional software applications. The Application Manager also suppresses all the other application steps which can include bundled items and advertisements. Reason Core Security offers its Bundle Protection feature which works in a similar way to the Application Manager feature. Of course, there is no point in denying the fact that a firewall has no other option but to protect the user’s system against any and all attacks that come from the internet. In order to check all such claims, reviewers normally try to hit the given test system with a total of 30 system exploits which one can easily generate via tools such as CORE Impact penetration tool. Our research shows that Kaspersky is able to detect and then block a total of 80 percent of all exploits. In fact, Kaspersky can actually identify a few of those exploits as well. It does that by checking such exploit’s official exploit tracking number. In this category, Kaspersky has little competition as its score is higher than almost all other security suites. With that said, the Norton Security Deluxe suite did spot and then blocked a 100 percent of all such exploits. Our research also shows that even if Kaspersky misses some exploits, the exploits are unable to breach the full security. Because the system is likely to have all the required security patches. However, it is nice to see Kaspersky keeping an eye out for any cyber attacks of this type. One thing that we want readers to understand is that their security protection is pretty much worthless if a given malicious application and/or program has managed to turn the security off. A malicious script can do the same as well. When it comes to Kaspersky, our research shows that its defenses are strong enough and effective enough to take care of any such malware program techniques. Our research also shows that Kaspersky can and does do well enough to not let the Registry of the system get exposed. Kaspersky doesn’t allow anyone or any process to set the Security Enabled option to False. It also foils all attempts to kill off the product’s two core security processes by using the Access Denied “utility”. With Kaspersky in place, users don’t have to worry about attackers making attempts to manipulate any of the user’s machine’s Windows services. Of course, a given malicious program does not even have the ability to get past all the other layers of protection that Kaspersky offers, to launch an attack. Apart from the firewall protection component, there is also the Network Monitor component. There is a debate about whether one can consider the Network Monitor component to be a part of the firewall protection component. However, the Network Monitor provides all the tech-savvy online consumers the insights they need to know what applications are involved in eating up what amount of bandwidth. There is also a live graph. The graph’s job is to chart the overall outbound and inbound traffic. It also provides users with a list of programs that have active connections. The list actually breaks down the internet usage by showing the user who is using what amount of bandwidth. Most users will not have a hard time in finding out that Kaspersky tries to put most and maybe even all of their active applications in a category that it calls Trusted. The Trusted Applications mode actually takes that concept and kicks it up by a notch or two. It does that by denying any type of execution to any given process which it is unable to verify as a trusted process. To begin the proceedings, the Application Mode scans all of the user’s files. Then it identifies all the trusted ones. And after it has finished doing that, it refrains from allowing any and all untrusted applications and programs to run. The Trusted Application mode is very useful on a machine which does not experience a ton of new application installations. Our research shows that the Application Mode’s functionality which is based on a whitelist is pretty similar to what VoodooSoft VoodooShield brings to the table. However, there is one big difference. The VoodooSoft VoodooShield applies any and all of its rules only when it detects that the machine is under threat or is at risk. This usually happens when the computer has connected to the wider world of the internet. For its part, Kaspersky does warn the user that the initial scan could and probably would take a considerable amount of time. Our research shows that indeed on a given test machine it can take around two hours to completely finish up its work. This is where we would like to mention that when Trusted Applications mode does complete its initial scan, users should pay a bit of attention. If the Trusted Applications mode scan finds some unknown files in the system, the user should take the time to carefully review that file and see what the mode has found about it. Our research also shows that sometimes the unknown system files may just be nothing but files that the machine’s manufacturer supplied. Most of the times, these are legit. Before moving ahead, we would like to mention just one more significant step. And that step is for the user to review each and every unknown file that the Kaspersky Trusted Application mode would block. Our research shows that if a given test machine has some custom testing and evaluation scripts, utilities and other things, these should go straight to the blocklist. So if they do, users should find it perfectly sensible. Interestingly enough, the Kaspersky Trusted Application can sometimes list a lot of files which are related to the official Microsoft Office application. Hence, users should take great care and make sure that the list is correct and unblock all the programs which are legitimate and important. Our research shows that if the user has activated the Trusted Application mode then it should become impossible for any given malware to run on the user’s system. This holds true even for that type of malware which is totally new. So new that none of the many antivirus researchers in many corners of the world have seen it. Because of the system’s thoroughness, it is entirely possible that it may block some new applications which the user may make an attempt to install. Kaspersky always includes a link in its blocking notification which enables the user to go ahead and mark a given unknown application and/or program as a trusted one. Reading the term PC Cleaner will surely give readers the idea that Kaspersky offers this component as a way to clean up the system’s junk files. Maybe the developers designed it to remove the traces of the user’s computer activities. And perhaps they are entitled to think like that because a lot of security suites include these bonus features. These are very common actually. However, in the case of Kaspersky, the purpose of the PC cleaner is very different. Some say completely different since most of the times such components are actually shared with the given antivirus’ other components and they handle certain tasks together. With Kaspersky, the PC Cleaner feature is actually a scan which looks for applications and programs that don’t fall into the category of malware. It also looks for programs that are not even present in the category Kaspersky marks as low-risk and potentially unwanted ones. The aim of this scan if to find all the programs which the user may want to delete from the system. And it has plenty of reasons for it. Some of the reasons include programs which are actually nothing but malware and programs that the user rarely makes use of and finally, those programs which have non-standard installations. Our research shows that the test scans should not take any modern machine too long. If the user does not use Firefox, then PC Cleaner will report so. That may be true for some and not for others. It is entirely possible that the user may only use Firefox for testing purposes and then use the virtual machine’s revert function in order to take the machine back to a state that is safe afterward. For such users, PC Cleaner may present them with the option of uninstalling Firefox or to simply hide the application in its report. The same feature also enables the user to report any other annoying applications directly to the company’s Labs. The user can do that by pointing the application out with his/her crosshair-shaped virtual cursor. It has been our experience that whenever there is talk about a cross-platform online security service, Mac user very commonly have to settle with getting the short end of the virtual stick. Such a security suite is usually exploding with new and shiny features if a user installs it on the Windows platform. However, when the same user installs the security suite on a given Mac machine, that powerful security suite suddenly turns into a basic antivirus application. The official Kaspersky Internet Security for the macOS platform provides users with a full security suite that comes filled with protective features. Now, even though it has all the features of the security suite and is a standalone product on its own, it costs only as much as the most basic of antivirus products for the Mac. Of the four independent antivirus testing labs that we like to follow, only two carry out tests for the Mac versions as well as the Windows versions. Both of them have tested Kaspersky. Which is, again, a big deal. Pretty much like Bitdefender, Kaspersky is also able to detect a full 100 percent of the malware (for the Mac) that antivirus researchers working at AV-Comparatives could manage to hit it with. Moreover, both Kaspersky and Bitdefender earned top marks in tests that researchers carried out with Windows malware. Competitors such as Trend Micro, Symantec, Intego, Bitdefender also earned the highest marks in tests which the AV-Test Institute carried out. Kaspersky also managed to come close but did miss the highest mark by half a point. Phishing sites are essentially sites that fraudsters put up in order to try and steal the user’s secure login information. These phishing URLs are not really specific to any given platform. However, it is also true that protection against any type of phishing is actually different from different platforms and operating systems. Our research shows that when put under testing, Kaspersky has the ability to detect a 100 percent of phishing URLs. With that said, it is also true that for the same phishing tests the Mac version scored a little lower, 83 percent. The Safe Money feature is also available for the Mac platform but it works a bit differently. For the Mac, the Safe Money feature does not actively protect the web browser. It actually verifies if the user is visiting a site that is a legitimate banking website and not a clever little fraudster website which is masquerading as a genuine site. The Mac version also has a simpler parental control system. It has a content block filter which has nine categories. Our research also shows that the time-scheduling component of the parental control system is a bit less fine-grained. But just like on the Windows platform, Mac users get access to the private data protection feature. As far as the Webcam protection component for the Mac goes, it comes in the form of a simple off/on switch. It doesn’t have the system of those trusted applications and programs which always get the green light when it comes to access privileges. The Mac version can also block the web browser tracking code. Although it does not have the ability to display the total number of trackers that it has blocked for the site that the user is currently visiting. Some of the other features that Mac users can take advantage of include the network attack blockers along with on-screen keyboard and search results online markup. All Mac users have the option of installing the Kaspersky Password Manager and Kaspersky Secure Connect on their machines. We feel that the Mac version of Kaspersky Internet Security is definitely much more when compared to a basic antivirus for Mac. 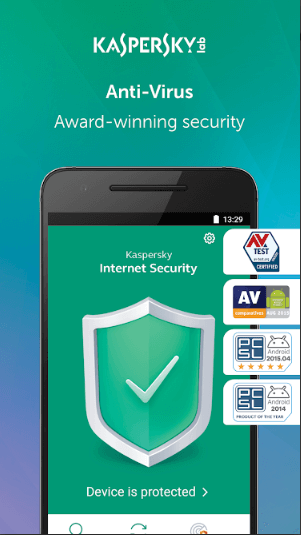 Any online user with an internet connection can actually download and then use the Kaspersky Mobile Security free edition. However, if the user logs in to his/her My Kaspersky account and then add the device to his/her license, he/she gets complete access to all the Kaspersky features. The Android application has a main window which reflects the user’s security status. If it finds that everything is well and fine, it shows the user a big green icon in the shape of a shield. Users can also choose many other features from a full panel of icons that is expandable. The latest edition of the Android application brings something new. For example, there is now a left-rail menu. This menu offers users a second method to access all the features. A few seconds after the user has finished the installation process, Kaspersky Android automatically runs the process of scanning and updating. If the user finds that the app’s primary windows, or the main interface, is still yellow even after the first scan, then he/she should know that there is some work to be done. Our research shows that most of the time, if the user simply turns on the active internet protection component, the yellow window would turn into a serene green indicating that everything is fine. This is just one on-demand device scan. Additionally, Kaspersky also provides users with real-time antivirus protection. It can check all new processes and apps. 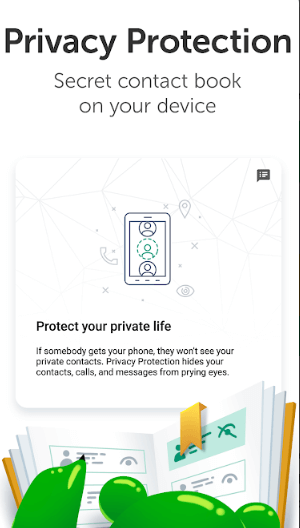 There is also a recommendations page which walks the user through all the setup choices including setting up the user’s privacy protection and enabling features such as anti-theft. One problematic part of the Android app is its privacy protection component. The purpose of the privacy protection component is to simply let the user maintain a comprehensive list of his/her private contacts which would never show up in the user’s history or address book. However, users will find that a warning message will point out to them that the feature may not actually work for all those users whose devices are using Android 4.4 or later. Moreover, it also requires the user to turn off features such as syncing one’s contacts to one’s Google account. 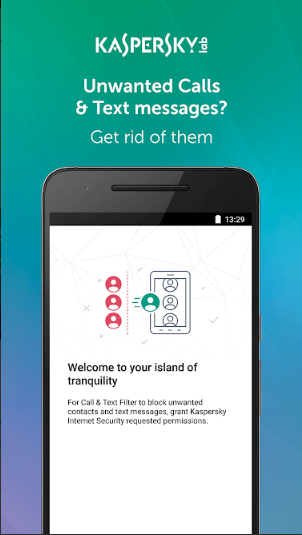 In a case where the user decides to uninstall the Kaspersky Android application without first making sure to unprotect those contacts, the action could permanently delete their contacts. Our research shows that users should not expect Text and Call filter to work on Android 4.4 or later. However, this one problem is a problem that is present on all security products that make an attempt to offer a filtering feature. There is also the Text Anti-Phishing feature which is supposed to scan links that appear in various SMS packages. Our research shows that it sometimes does not show a proper warning with a display. 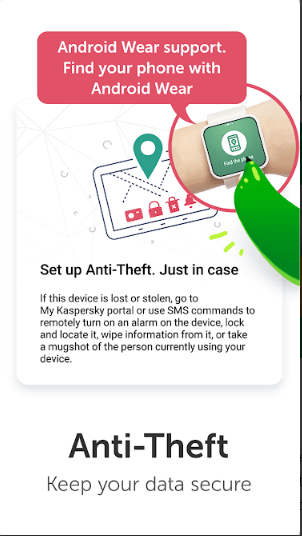 Kaspersky, for the Android platform, also offers various anti-theft features. Sound a loud alarm. This feature comes in handy when the user can’t remember where he actually left his device. However, the actual implementation of such features is reasonably different from that of other competitors such as Bitdefender. There is no way for the user to simply locate his/her device willy-nilly. If the user performs a single click or even gives an SMS command, the device would both lock up and then report its current location. Such an arrangement does have its advantages. For one, even if a hacker compromises the user’s My Kaspersky account, he/she still cannot track the user’s location without the user’s knowledge. Similarly, if the user has a desire to get any mugshots of the thief or any person who is utilizing his/her device, then the user has to lock the device. It doesn’t matter if the user just wants to lock his/her device or wants to request mugshots., Kaspersky provides a way for the user to include a message in there. In cases where the thief swaps the currently installed SIM, Kaspersky does a good job of sending the user the device’s new number. Apart from that Kaspersky, also enables users to put selected application behind a strong PIN lock. It does that so even if a thief manages to pick up the user’s smartphone device or a tablet while it has no lock on it, Kaspersky could still move in and prevent any access to the user’s social media and/or email service. Bitdefender offers something similar in name but different in function in the sense that Bitdefender manages to go the extra mile. It doesn’t just offer a simple lock. 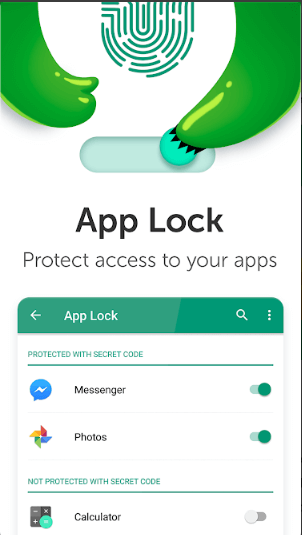 It combines options such as enabling a brief hiatus just before demanding the phone’s lock password again AND automatically unlocking the device when the device has connected to a trusted network, to create a complex lock system. All security companies are familiar with the fact that if they offer products which have visibly performance impact, their customers would simply turn off their products. Sometimes, the user jumps ship to the company’s competitor brand. Perhaps that is the reason why very few modern online security suites impact and slow down user machines. However, our practice is to do some research on some simple methods and test which are available to measure a given security suite’s performance impact. Our experience tells us that whenever the user loads up a given security suite’s full set of security features and components right at startup time, it leads to a system slow down. In other words, it increases boot time. For the end user, it increases the time the user has to wait until his/her machine is properly ready to go and work. Luckily, there are some boot scripts that one can use in order to measure boot time. Such measurement scripts usually check the given machine’s CPU usage just once after every second. And they deem the given system as ready for use after a total of 10 consecutive seconds during which the CPU usage percentage has remained under five. If one subtracts the actual start of the boot process which is readily reported by the Windows operating system from the measured boot time, it should shield the change in boot time. One has to average out multiple runs on a machine that has no security software. And then do the same with a machine that does have a security suite. Our research shows that on average, Kaspersky managed to add a total of seven percent to the machine’s boot time. In seconds, that translates to four seconds. In other words, it is highly unlikely that the user will notice such a slowdown. However, it is also possible that the user’s security suite could put a huge drag on the user’s everyday activities related to file manipulation via its real-time antivirus monitoring component. For measuring this impact, one has to use a script which is able to move and copy an eclectic and large number of files between various drives. Again, one has to average out the results with and without a security suite on a system. Our research shows that Kaspersky activity impacts the system by just one percent. Another script which some use is the script that zips and then unzips a given file collection multiple times. Our research shows that for such processes Kaspersky had zero impact. In other words, zero measurable impact. So, all in all, Kaspersky averages at just a meager four percent. This means Kaspersky is pretty light on resources. Users should take note that other security suites such as from Webroot, Norton, Bitdefender, and Adaware exhibit zero system impact as well. In fact, they score zero in all the three tests we mentioned above. The whole point of installing a great internet security suite is to first have access to all the necessary advanced security features and then to have them work together via a single and integrated easy-to-use package. An excellent example of that is the Kaspersky Internet Security. It offers features which go far beyond what the user is likely to get in the majority of other online security suites. Our research shows that Bitdefender Internet Security along with Kaspersky Internet Security are indeed the best security suites available in their class.